I'm a black woman. Why do people assume I'm not a doctor? I’m a young black woman. Why do so many people assume I’m not a doctor? Over the past few days, social media has been on fire with the story of Dr. Tamika Cross, who was flying on Delta when a flight attendant asked for a doctor to help a passenger in medical distress. Cross tried to jump in, but the flight attendant dismissed her, not believing the young black woman offering to help was a physician. Actual physicians. After a decade of schooling, after finishing medical school and starting my residency, it’s maddening when people misunderstand the role I play in the clinical setting — even when I’ve introduced myself, I’m wearing my credentials, and I’m wearing my long white coat. I’ve been in Cross’s shoes. Many black doctors have. Two days before Cross’s ordeal, I was performing a neurological exam on a patient, testing her strength and her reflexes in her arms and legs. In the middle of the physical, a food services employee walked into the room and interrupted the exam to take the patient’s meal order. “What would she like for lunch?” the man said, clearly not seeing that I was in the middle of treating the patient. That day, I wasn’t in the mood to deal with racist nonsense while trying to take care of my patient. I wasn’t in the mood to smile or be congenial when this man not only disrespected me, but disrupted my work. I stopped my exam and stood up straight. “I don’t know,” I said, waiting for the man to realize who this person was, standing before him with a stethoscope around her neck and reflex hammer in her hand. “Fish or chicken?” he asked. I could have told him that I was a doctor, but why? Why do I need to keep explaining who I am in a space I have earned, and where I know I belong? That day I had no interest in shouldering the double burden of oppression. All this time I spend explaining who I am is time I’m not spending being who I am. “Don’t you know what she likes?” the man asked, growing more annoyed. My patient was black, so maybe a fleeting glimpse might have led him to the conclusion we were family. Yet, despite watching what I was doing and seeing what I was wearing, this man couldn’t see that being a doctor was a logical explanation for who I was. Just like when my mother, also a doctor, tried to park her car in a physicians-only parking lot and security refused to let her in. Just like when Cross tried to live up to her oath as a doctor and was shot down because she didn’t look doctorly enough. I threw my frustration out to Twitter, much as Cross threw hers into Facebook. It's so upsetting when people assume you are everything but a doctor. In the days since Cross’s posting, #whatadoctorlookslike has started trending. 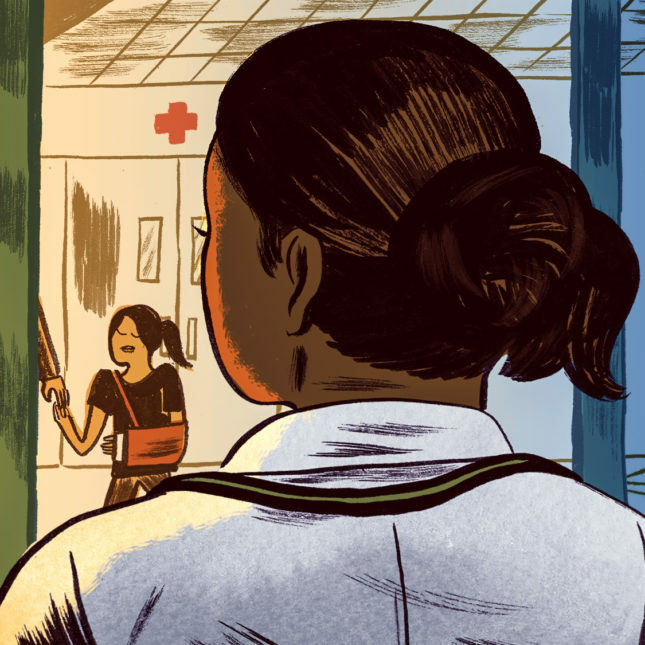 Black female health professionals have told their stories, shared their pictures in scrubs and white coats, and tried to break the stereotype of what a doctor looks like. It’s inspirational that there are so many of us, doing so many wonderful things. But it’s also sad, because here we are, once again, forced into explaining why we belong in the space we’ve earned. We are here. And we are what a doctor looks like. And reduces you to a “random black person” this happens to be on a daily basis and the worst part is I’m not even black. My race is often the first topic that springs out of a persons mouth when they first speak to me from a barista at Starbucks to a salesperson in a shop. These normally coming from people who are tourists or who take a train from outside my neighborhood yet feel they belong there more than I.
It’s difficult to be someone who disciplines themselves in all facets of life and holds back from engaging in any dating, sexual activity, alcohol, or any form of drugs or smoking. Someone who spends EVERY NIGHT home with their parents because they have been socially alienated and excluded their ENTIRE LIVES. Yet, is met with racist assumptions of promiscuity, alcoholism, laziness, uneducated, low income, drug using, and many boyfriends — going out every night etc. these stereotypes hurt as the women who actually partake in those activities most are seen as clean and pure because of their white skin color. It’s so painful and psychologically harming it has taken toll on my health and I find myself shutting away in my home and only leaving to attend classes because of the impending doom of bullying and harassment. Young women of color receive no respect and no dignity in this world. I have a friend who is also a doctor and she is black. Well I don’t see any problem aside from that she is black and people just seem to see it differently. That is such a hard thing. Hey i would like to share this new fake ultrasound design from fakeababy. the funniest most amazing stuff ever. Check out on this. I am a young, female, white, M.D., and almost no one believes that I am a physician in practice, or even out and about. By young I mean 30 (so not very young and I certainly don’t look it..I have never been the type that was often asked for my ID). My male counterparts don’t experience the same. I do see the race discrimination, but I think in medicine, gender discrimination can often be worse. Being a person of color (Latino), I can frankly say I’ve never had an issue like this. I have, however, witnessed many cultural pride issues among my ethnicity that prevent them from being viewed as the professionals they are. It has to do with how they use and navigate the English language. Many times, I’ve come into contact with people who have Bachelor’s and Master’s degrees who sound like they’ve just stepped off the streets of a low income housing development. They may LOOK the part, but for many people they don’t SOUND the part. The cultural pride is this: many feel that “This is the way I speak… if they don’t like it, then…” and you can fill in the expletive. Back in the day, being professional was a sense of pride… we aspired to be better than we were. That means, as the Bible puts it, “… putting away the old personality and putting on the new one.” Dropping slang, dropping the colloquialisms, dropping unprofessional attire when not “in the role”… these are all things that would go a long way in establishing an identity that others can identify and trust. I know the thought… if you’ve read this far… is “Why should I have to change who I am to please other people? !” It’s because there have been national… and INTERNATIONAL… standards of professionalism and excellence for decades. Just because we may not feel we have to change, the many thousands of people who will rely on our services demand that we at least LOOK and SPEAK the part, and not like we’ve just stepped in off the street and put on a lab coat. Why does everyone assume it was a discrimination by skin color and not by age? She looks very young after all. Less black people are Doctors, sometimes things are just this simple. Jesus stop with the professional victimhood, everyone encounters difficulty, struggle, try not to walk around looking for a vast conspiracy behind everything. Life is not fair, focus on the good things and what you can change. Less white people are not racist, sometimes things are just this simple. It’s why everyone just assumes that whites are racist. Which is why I don’t understand why whites get so mad when people accuse them of being so. Kramer, It is one thing to mistake a person for not being a doctor and another to out and out accuse a person you don’t know of being racist with no evidence to back up that assumption. The second situation involves deliberate accusations based on an untested assumption. There is emotional aggression involved. Confrontation. No harm or aggression but possibly thoughtlessness was the circumstance in the first instance. Because people rarely run into such a person as a doctor. I guess it depends on where you live and your circle of friends as to why you don’t see them that often. Are you suggesting that Black doctors are so few that they are hard to find? In large cities it’s not that difficult to find one. I don’t know about small towns. I know several black doctors and I am surprised how much they give back to their churches, civic groups and schools. They are integrated in communities and not rarely seen outside their practices.